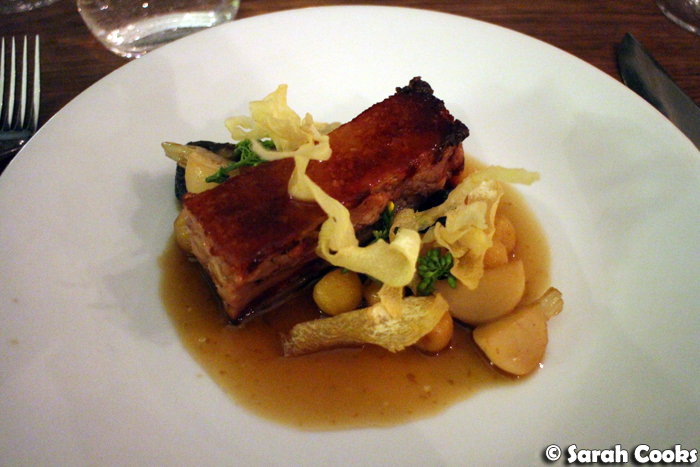 Last year, for my friend Alaina's birthday we took her out to dinner at Merricote, in Northcote. I hadn't heard much about the restaurant previously, but Alaina had mentioned it was on her wish list, so when her birthday rolled around it was an easy decision! You may have noticed that my last two restaurant posts - The Town Mouse, and All You Can Eat Yum Cha at The Roving Marrow - were also birthday gifts for friends. 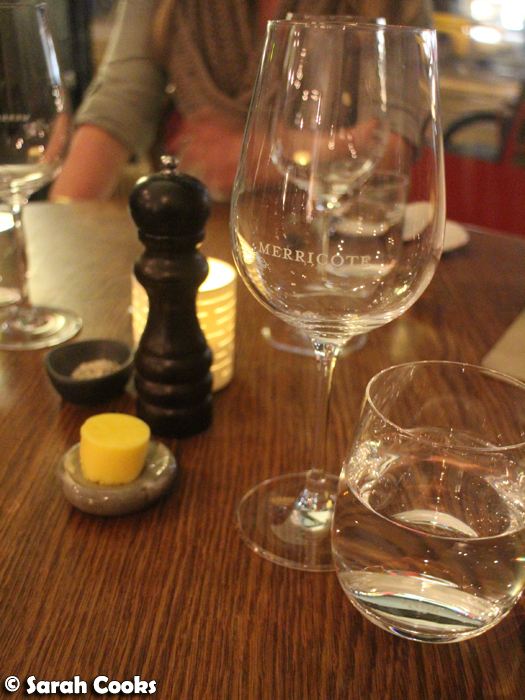 I've actually got a couple more birthday-gift-restaurant-meal-blogposts coming up too - ESP by Scott Pickett and Dinner by Heston Blumenthal. What can I say? I'm terrible at choosing gifts, and by taking a friend to a restaurant they've been meaning to try, we get bonus social time and I get to try the restaurant too! Win win win. (And incidentally, if anyone is stuck for a gift to give me, a meal out would always be very much appreciated, hint hint). So, Merricote. Upon entering I was impressed by the quirky and warm atmosphere - it kinda felt like being in an old fashioned lounge room. And it totally matches the Northcote vibe. I didn't realise the restaurant had such a strong Dutch influence - very cool! 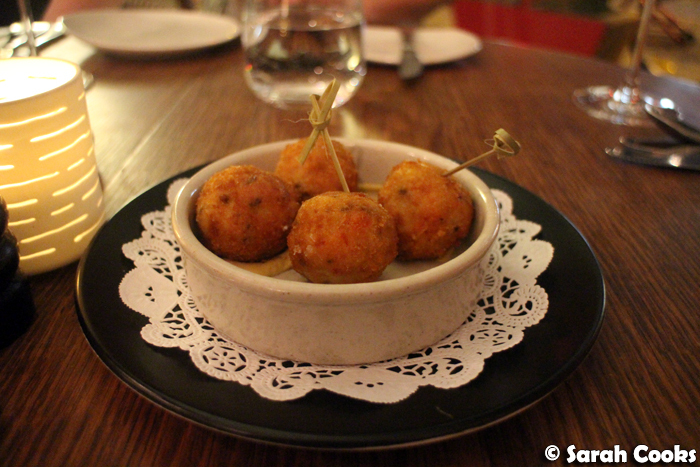 We started with some tasty bitterballen (deep fried curried chicken croquettes) with dijon mustard. Our next snack, 'Boter, Kaas, Eieren' (butter, cheese and egg), was a variation on that staple of contemporary fine dining - a soft egg yolk topped with a variety of crunchy morsels, for a taste and texture contrast. 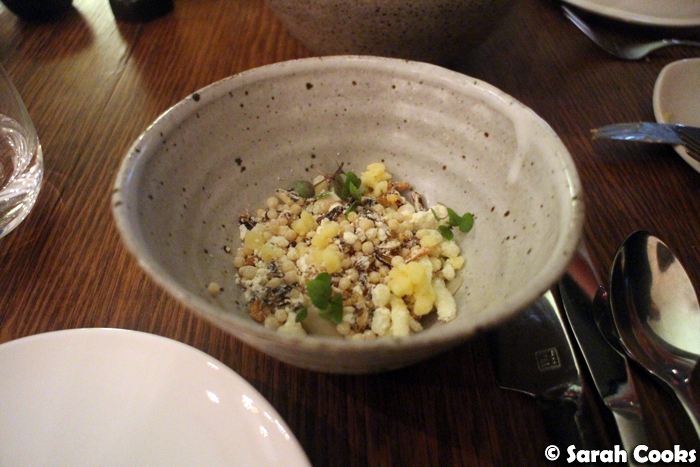 Here, the crunchy morsels included puffed wild rice, and aerated crunchy cheese sticks. (Think like Twisties or Cheezels, but much nicer). 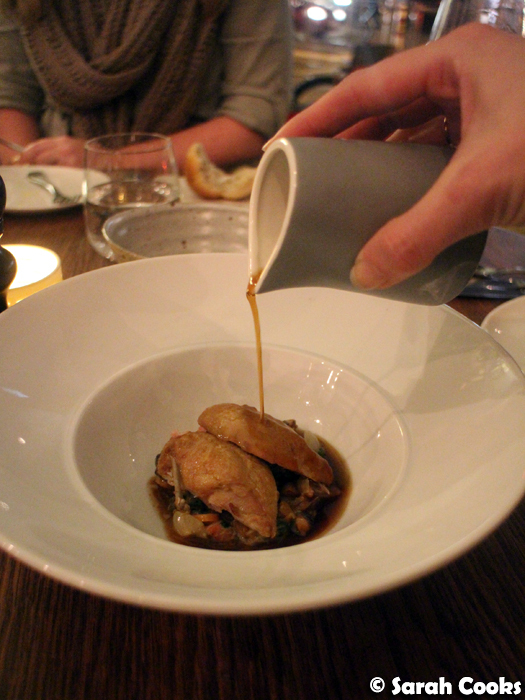 The roasted quail 'Bourguignon', with snail, barley and broth was a well-executed dish. The quail was lovely and tender, and the broth was richly flavoursome. The next entree was a fancy, restauranty take on the classic combo of beetroot and goats curd, with the addition of rhubarb, shiso (AKA perilla, a herb in the mint family), and wakame. 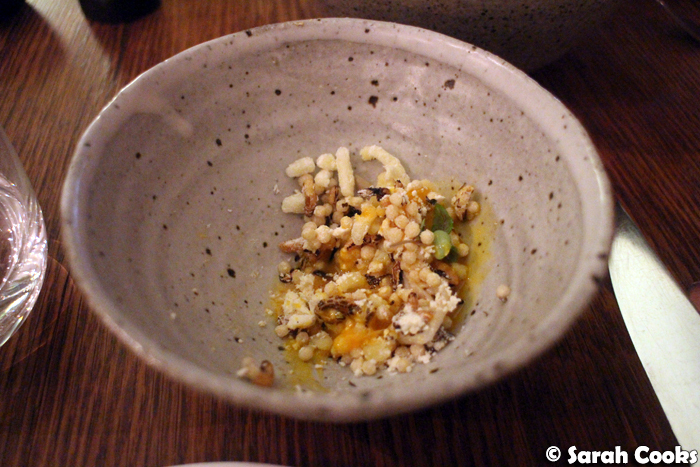 I was most intrigued by the idea of coffee custard, with yuzu, seeds and oats. It also came adorned with bonus little waffle chips! Crunchy and adorable. This one was my favourite of all the entrees - the coffee custard was warm, rich and smooth with a subtle bitterness from the coffee. 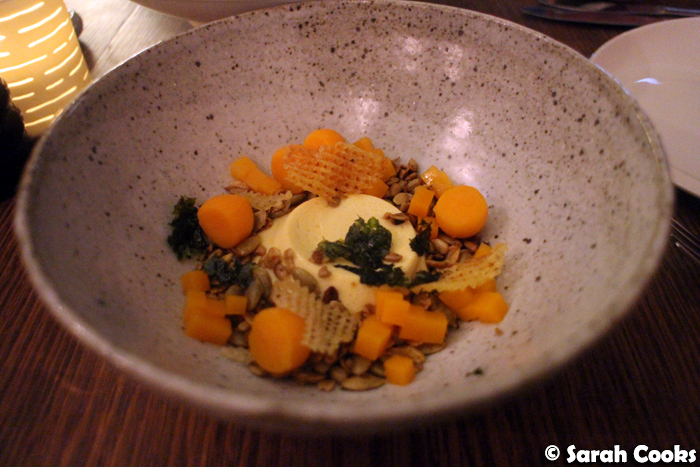 It contrasted well against the sweet pumpkin pieces and the crunch from the toasted oats and seeds. I ordered the wagyu beef, and I'm so glad I did - it was absolutely heavenly! 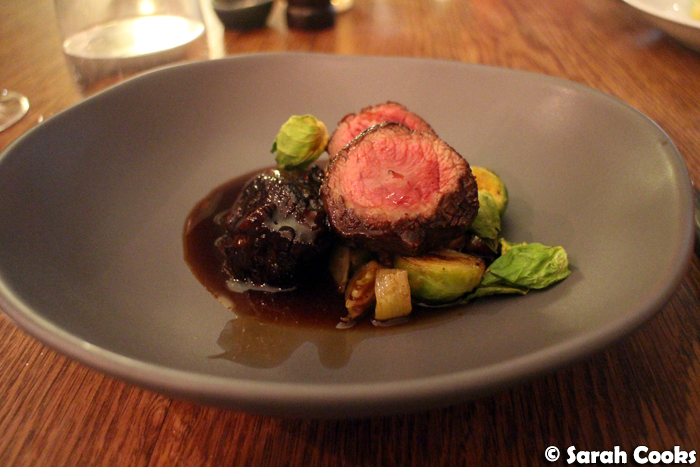 The beef fillet was perfectly rare, and the slow-cooked shin was meltingly tender. The jus was incredibly rich and savoury - just delicious. 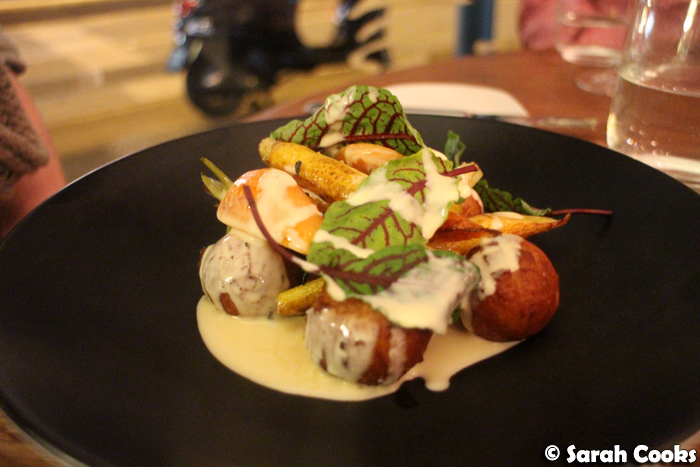 The saffron chowder had a very intense shellfish flavour - definitely one for seafood lovers! Overall this was a good dish, with the fish cooked perfectly, although I think that my friend Simon found the idea of cold mussels in the salad a little offputting. Donuts for dinner? Why not? This was the birthday-girl's dinner of choice, and the potato beignets were rich and comforting without being stodgy. Sandra ordered the pork shoulder - she commented that the meat was nice and tender, with good flavours but could have had cracklier crackling. How cute is the presentation of the viking potato? 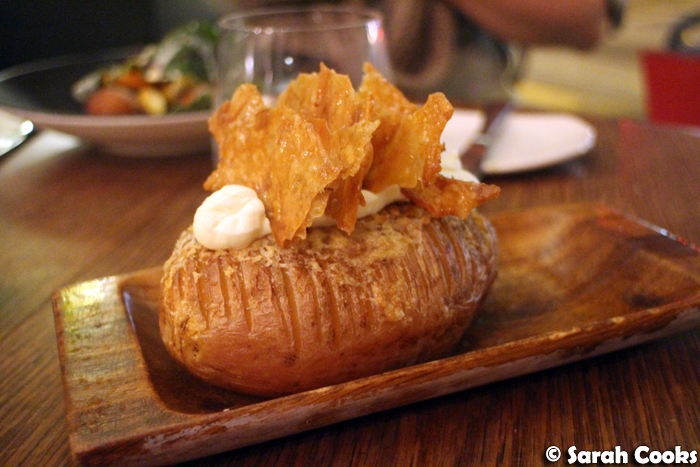 I loved the sails of chicken crackling adorning their potato ship. The greens, ordered because we thought it would be a Good Thing to have some vegetables, were a little underwhelming. This of course wasn't helped by the fact that the winter greens turned out to be rainbow chard, my most hated of all vegetables. (It's one of the rare things I actually don't enjoy eating - probably should have asked beforehand!) But no-one else on our table really made a dent in them, so I don't think this was down to my weird chard-aversion. 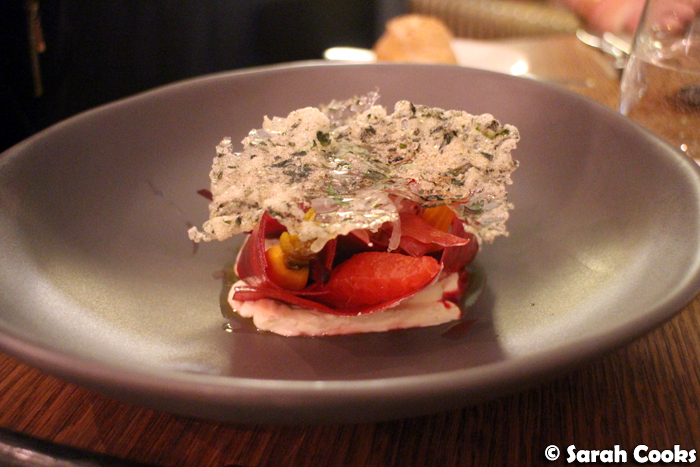 The first dessert was called 'Hooiberg', or haystack in Dutch. I loved the presentation of this! 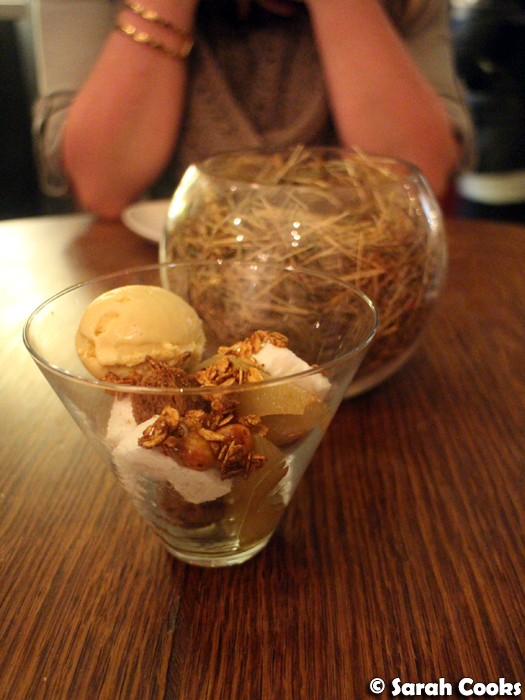 The 'haystack' was like a parfait or ice-cream sundae comprised of hay-infused ice-cream, poached pear, crunchy toasted oats and chunks of Ontbitjkoek. (Ontbijtkoek is that Dutch breakfast cake that's kinda like gingerbread. You can get it here in the European aisle of larger supermarkets, and I've had it in Holland as well.) 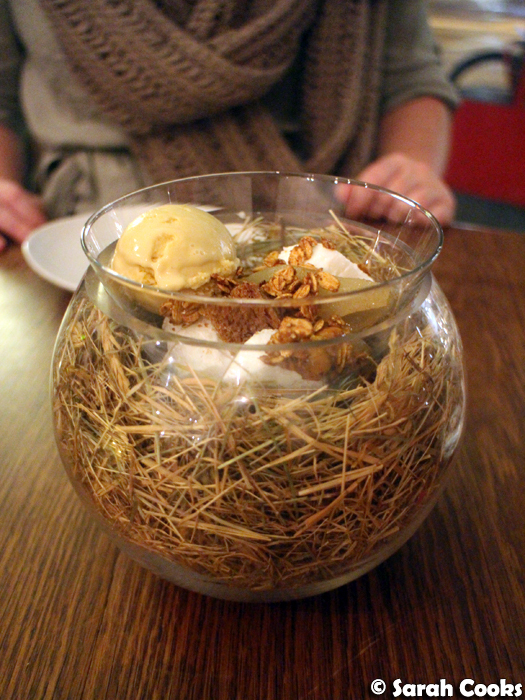 I wasn't sure what hay-infused ice-cream would taste like, but it really worked. 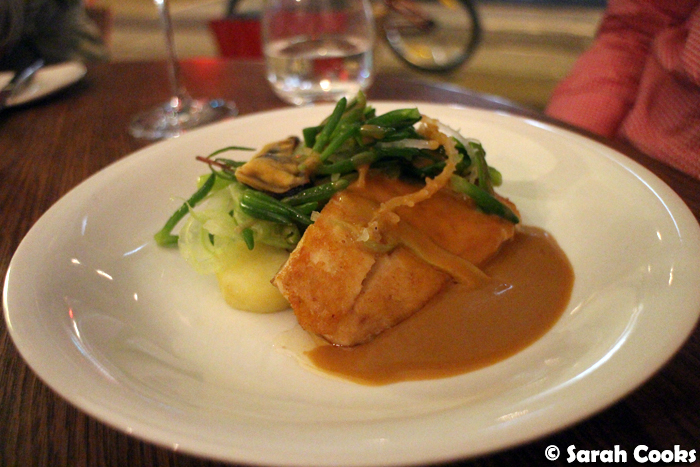 It had a subtle earthy flavour and was very enjoyable. Our second dessert wasn't quite as visually impressive, but it sure was good! "Oma's Risterbrij" means "grandma's rice pudding" in Dutch (we googled it! ), and it was incredibly rich and creamy, and comfortingly soft whilst still retaining the integrity of the individual rice grains. 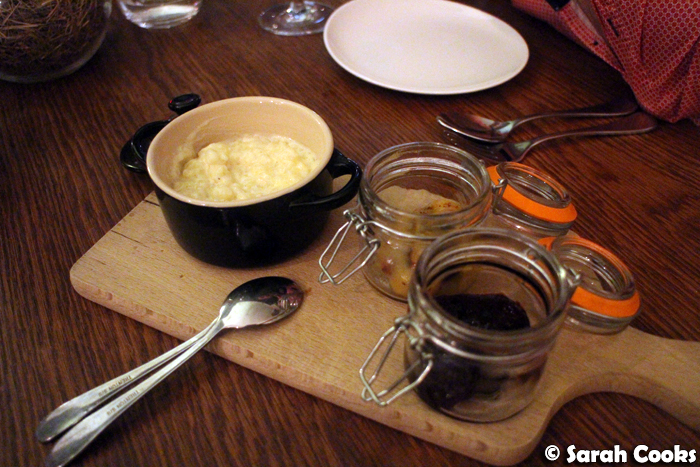 The accompaniments - housemade jam, and a gooey pistachio caramel, were absolutely delicious. I kept going back for that caramel long after the rice pudding had been finished. Overall a very impressive meal at Merricote! 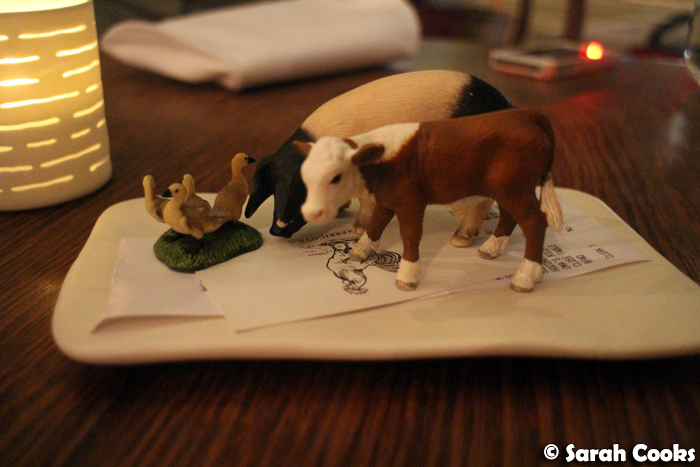 The food was well executed, creative and unusual. 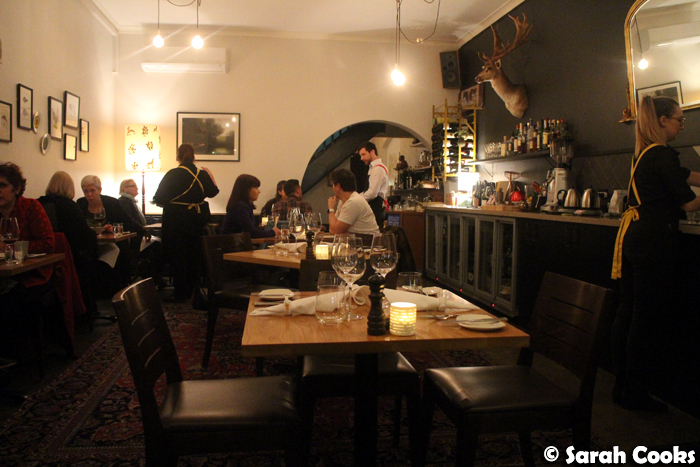 The atmosphere was cosy, and the service was polished but friendly. Definitely recommend! I visited last year (but still haven't blogged it). 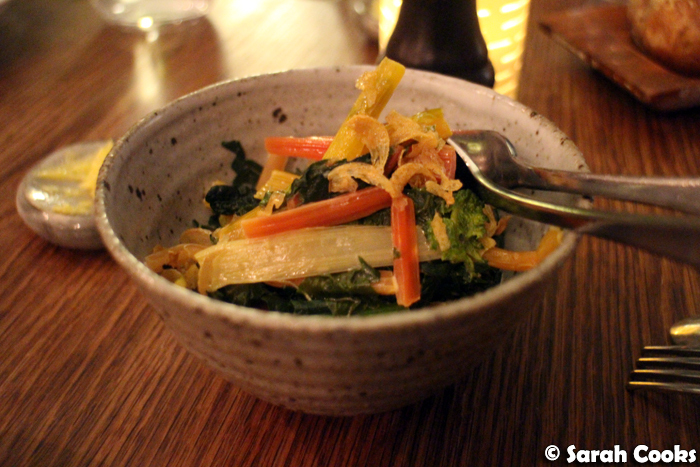 Loved the unusual dishes here - really wish we'd ordered the haystack now. So cute! That looks so interesting, and so unlike anything I've ever tried before! Particularly those desserts...yum! The place looks so vintage and it has this classy vibe. I'm sure the food is great. And I like that viking potato. It's so cute!